I’m not sure how it is that I got several review copies last year from Creative Editions, but I’m glad I did. One of them was this beautiful book, featured a couple weeks ago. 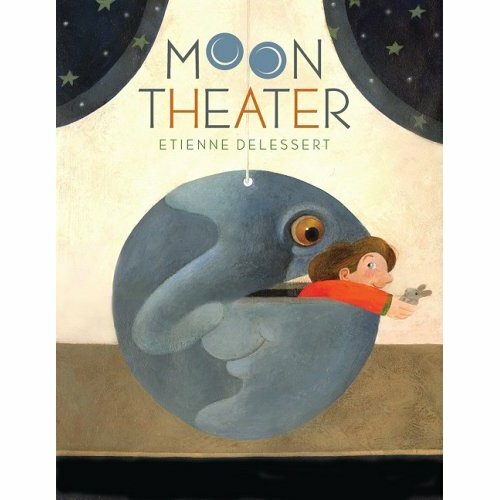 The book featured today, Moon Theater (August 2009), written and illustrated by Swiss-American illustrator Etienne Delessert, was another one. 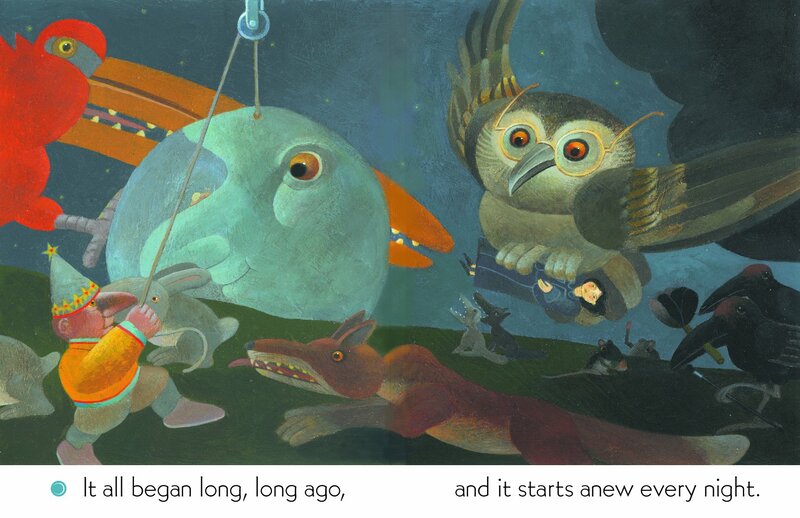 This is a haunting and weird (weird = compliment) and memorable picture book. When I read it, I felt like the child version of myself taking in a Sendak book again: Both the story and illustrations have that type of mystery and beauty and slight terror nestled in them. I’ve only got this one spread (above) this morning to share. Wish I had more, but isn’t that beautiful? That’s the moon theater in action. You can click to see it in more detail. Look at that huge moon, getting raised to the night-time stage. That’s just creepy-good is what it is. Moon Theater tells the tale of a young stage hand, who—as revealed on the cover here—is the one responsible for the backstage magic behind the moon theater that is the night. “Every evening, the moon enters the wide stage of the night,” the book opens. “A very old man pulls the moon up and sends it on its journey. But my work backstage begins much earlier.” The boy waters the stars, dresses the birds in long black coats, trains wild dogs, plays tricky games with the rats, feeds the hungry night monsters, and more. Challenging to describe. Needs to be seen. If anyone else gets a copy from your library or bookstore, come back and discuss with me. I think it’s one-of-a-kind. And I’d love to see more of Delessert’s books. I’ll have to embark upon that adventure. Look out, library: Here I come. MOON THEATER. Copyright © 2009 by Etienne Delessert. Reproduced by permission of the publisher, Creative Editions, Mankato, MN. 1). Well, wasn’t it mighty fun to hear all the ALA winners this week? Congratulations again to everyone! While we’re at it: Remember this book? It was awarded the 2010 NCTE Orbis Pictus Award for Outstanding Nonfiction for Children this week. Congratulations to Hester Bass and E.B. Lewis! 2). 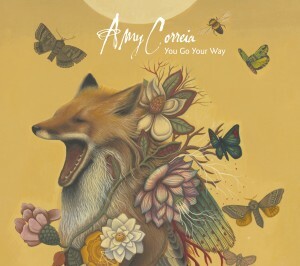 The cover of Amy Correia’s upcoming CD, pictured here, which I can’t flippin’ wait to hear. That painting, I read, is by Scottish artist Lindsey Carr. 4). Watching the old skool Looney Tunes of the Chuck-Jones era with the girls. They think Wile E. Coyote is particularly tragic and hysterical. 5). Jack Daniels’ Whiskey Praline Pecans. 6). This. The “empty areas where we have yet to map” part gives me the shivers. 7). It really is remarkable to me, though they undoubtedly have their spats, how considerate my girls are of each other. They’re probably gonna have a shouting match in five minutes to prove me wrong, but sometimes it just slays me how kind they are to one another. BONUS: Hearing “Hey, Jack Kerouac” in a coffee shop this week. I can’t not sing along quietly and subtly dance, so I just look like I’m talking to myself or having spasms. The CD from which that song comes takes me back to high school somethin’ serious. NOTE: The one-and-only Little Willow (who I think would love Moon Theater, incidentally) has launched a creative contest/give-away at Bildungsroman in honor of Raina Telgemeier’s new book, Smile, which is a graphic novel for kids based on her childhood experiences (and embarrassments) — and which looks really good. Here is all the info. One of my life-long dreams is about to be realized. I am now SAG-eligible. All it will take for me to become SAG = paperwork and payment. I am about to utter an understatement: This is a very big deal to me. Hi, Etienne! I am a fan of the moon. Moon Theater looks pretty. I will have to track it down. Moon Theater looks fabulously dark! Little Willow – CONGRATULATIONS!! It is such a HUGE big deal for you to get your SAG card! And a testament to how hard you work that you’ve achieved it! Woot! Jules – so very odd, but last week while in New Orleans had an intense conversation about Wile E. with one of my oldest friends – so very cool that your girls enjoy him too! I am posting early because tomorrow will be packed with work/errands/brunch with friends, and since I have been awol for a few weeks, wanted to pop in and say I’ve missed everyone and their kicks. 1. New Orleans for a week. 2. Spending time with my most favorite friend in the universe. 4. Getting introduced (and addicted) to the entire season of Firely. We watched episodes every night, and it was great fun! 6.Feeding the 1st district chickens. My friend is a cop, and drives around with food for the chickens in his cop car. He took me to feed some, which was a lot of fun. 7. Planning my next trip back to New Orleans. Have a wonderful fabulous Sunday! I can’t wait to swing by later tomorrow and catch up on everyone’s kicks! 1. Down the big 4-0 in pounds. Yep 40 pounds since last February. 2. Finished the revisions on THE EMILY SONNETS (sonnets about Emily Dickinson’s life) being pubbed by Creative Editions. 3. Helping raise money for the beleagured Greenfield MA public library. It’s always wonderful to start a Sunday here, with the sunrise turning the snow pink for a bit. Thank you for the link to The Secret World of Walter Anderson, because apparently I was asleep at the back of the class when that came out. It looks like just the kind of book I love. 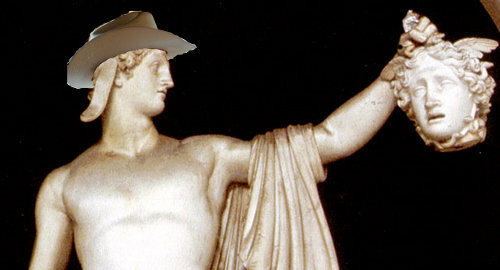 And Nashville boys and Medusa I think is just right: those myths are supposed to be about us. It’s a very kicky week for me personally. I started teaching my children’s lit class, and at the end of the first one when I told two guys they could sign up though it was a bit overenrolled, they gave each other high fives. I got stars on the first two reviews of my book coming out in March: Borrowed Names: Poems about Laura Ingalls Wilder, Madam C.J. Walker, Marie Curie and Their Daughters. Two days ago the mess of notes for a new book started to wink, like maybe there’s a shape there. Moon Theatre sounds wonderful. Our library doesn’t have it (I’ve just checked) but I shall certainly be on the look out for it. Have you seen Marcia Williams’ Greek Myths? My 5 year old loves it. Moon Theater is reminding me a bit of The Imaginarium of Doctor Parnassus. Also, Looney Tunes are the best. Little Willow, YAY, SAG MEMBERSHIP! I am glad to hear so many good things going on for you! RM, The image of your friend the police officer driving around feeding chickens is so hopeful. Sometimes humanity is awesome. Jane, 40 POUNDS! Wow, that is some kind of work you’re doing. Jeannine, I am intrigued by that exhibit, but I live about five hours away and have yet to commit to the drive. We have been tossing around the idea of buying a couple more book bins from them, so I’d have to go pick them up *sometime*. 1. The ALA awards on Monday were really just very exciting. Made my whole day. My whole week, even. 2. On Tuesday, I went to see The Mark of Zorro, a silent film, and they had a pianist on hand to do live accompaniment. It was totally fun. 3. On Wednesday, I went out for lunch with friends at a diner that also sells homemade chocolates. 5. On Friday, I had a busy work day, with two storytimes and two meetings. I was running a little late here and there, but I managed it all, and it felt productive. 6. I’ve had a blessedly plans-free weekend. 7. Yesterday, it was about 45 degrees and sunny here, so I went out for a nice, long walk. It seems so long since the last time I was able to go out without squinting my eyes shut against the cold and wind and snow. It does seem poised to start up again in a few days, of course, but I’ll worry about that when it happens. Love the idea of a moon theatre, and it’s always great to hear what funny things your girls say. Kids speak the truth. 🙂 Did somebody say Jack Daniels Whiskey Praline Pecans? And not bring some here for all of us to sample? Hmmmm. Big congrats and hugs, LW, on getting into SAG!! That is definitely big, big news. Fabuloso!! Good luck with all your upcoming auditions and interviews. Jane, what is your weight loss secret? Can’t wait to read your Emily sonnets! Oh, Jeannine, I love it when they lift up their chins! ♥ Thanks for passing that on, and congrats again on your starry stars! ALA awards, of course. So happy for all the winners. We have beavers down by the stream!! They’re busy chipping away at tree trunks. Warmer weather this week. Heck, anything above 25 degrees is a heat wave! The Hope for Haiti Telethon on Friday, and the general outpouring of love and generosity, despite these tough economic times. Adrienne, we were posting at the same time. I just had to come back and say, “Homemade chocolates!” 🙂 Silent movies are such fun! Homemade chocolates, homemade chocolates . . .
Little Willow, CONGRATULATIONS! That is wonderful news. I’m so proud of you and proud to know you. RM, an “intense” conversation about Wile I gotta hear about. So glad you got to go home, though I’m sorry it was hard to see, and good thing you saw friends and family. I love your chicken-feeding cop friend. Hi, Jane! 40 lbs? Hubba whoa. Congrats. Can’t wait to see the EMILY SONNETS. Jeannine, when they lift up their chins = my new favorite kick ever. Congrats on the starred reviews! Zoe, nope, haven’t seen that, but thanks for the tip. Will look for it. Japanese food. Mmm. My husband and I had the opportunity to eat some on an actual date out without kids for our recent anniversary, but I always always, when I get the chance to go there, pick my favorite Italian restaurant in Nashville. Adrienne, that sounds like a good, rich week. I love a good, saunter-y walk. The silent movie sounds like a lot of fun. Jama, isn’t the warm weather nice? We had a bit, too. I didn’t see that telethon on Friday, but it’s heartening to hear about all the donations. Very heartening. Congratulations to Little Willow on the SAG card; having been a drama major in college for a while I know from being around the field it is SUCH a big deal. Hurray for you! 1. Monday Awards – always so exciting, it was when I was a child, even more so now. 2. Lunch in a nice restaurant with a Board member (yes, a Board member) … I am so accustomed to sandwiches at my desk it was a treat of the highest order to have a delectable salad and good conversation in a nice setting. I am not high maintenance! 3. A belated DC birthday dinner of fish last evening at my favorite restaurant…jeepers, two nice meals “out” in one week, very special. 4. Starting NOTES FROM NO MAN’S LAND by Eula Bliss….heavy, stimulating brain. 5. The start of the choices for new RIF office…carpet, wall colors, lighting. 6. Excitement in the eyes of staff over the first steps in some new projects for this fiscal year. 7. Seeing pictures from my niece’s twins’ first birthday party yesterday — love those first birthday cake scenes! Am headed tomorrow to Arkansas to be with my father who is having outpatient surgery on second eye, first eye had the cataract removed in November. I’ll advertise the SMILE contest to RIF coordinators and volunteers. Jules, Jack Daniels’ Whiskey Praline Pecans?! Also, I’d really like to see you “talking to yourself or having spasms” in a coffee shop. Teeheehee! Jane, can’t wait for The Emily Sonnets! Adrienne, your kicks #2, 3, 4 are lovely, lovely, lovely. Jama, I want to see beavers, too! Carol, whoa. I love all your kicks! I hope your father gets well soon. 4. Thai food (pad Thai noodles, tom yum soup, green papaya salad, red chicken curry, rice, Thai iced tea). YUMMM. 5. I edit instructional materials for English teachers and we have hired a new writer… He also writes children’s books. Whoa. Guess we’ll have lots to talk about during lunch breaks! 6. Discovering Creative Editions from this post. Their books look exquisite! Jules, for a New Year’s resolution I think I must promise myself to run hard in the other direction whenever your kicks include the letters “CD” or the words “music,” “song,” or possibly even “hear.” This past week’s failure to do so means that I’ve got my first Patty Griffin album, and you’ve already committed me to Fleet Foxes, and someone whose initials are S and P — and now here you are sprinkling my head with this Amy Correia person’s magical dust. For the love of the gods, stop, I beg you, stop! And as others have noted, getting the SAG card will be huge. Congratulations! r.m. : Looking forward to my third (annual) trip to N.O. this June. Because I’m just tagging along with The Missus, who’s there for a conference, I’ll again have pretty much the whole day Saturday to myself, albeit on foot. By no means have I exhausted the Quarter/central business district experience, but I think I’m ready to start lingering and savoring a little. May come back to you for advice, even if I’m a little embarrassed by how timid and unadventurous I tend to be in new cities. That’s a fabulous book idea, Jane — the Dickinson sonnets. Will it be illustrated, do you know? Jeannine: ooooh, the image of a stack of notes about a new, unwritten book winking… somewhere out there is an artist who’s going to sell a lot of motivational posters of that to authors. Heh. adrienne and jama: Hooray for silent movies, especially when viewed in a theater! * Forcibly breaking a writer’s block by introducing two characters to each other whom I’d previously no intention of ever putting in the same room. A wacky experiment with a happy (though disturbing) outcome. * Remember the database of movie quotations from last week? This week — it’s still in testing mode, but what a great idea — we have a movie clips search engine. Just browsing through the clips without doing any searches is a fun way to kill, oh, probably 3 or 4 days. * Experimenting with a voicemail-to-text transcription service, and reading a message from my brother about “a conversation with Oscar.” And finding out that what he’d actually said was “a conversation with our sister.” I love having transcription software which makes the same kind of hearing-impaired mistake I make myself! * FINALLY saw the new Star Trek movie, and thought it was wonderful. Ditto Public Enemies… although it was a little sobering to follow it up on Wikipedia, reading about how many liberties they’d taken with the actual Dillinger timeline and other facts. * …and it was sort of nerd-kicky to have read that Wikipedia entry on a cell phone, without leaving the sofa (gods forbid I should actually have to get up and walk to a computer). I’m so happy for you, Little Willow! Congratulations! Jules, you always have great stories about your daughters so I wouldn’t worry about including them on your lists! Today was no exception! RM, I love the idea of a cop driving around with chicken food in his car. Brilliant. We have been madly busy recently, so having time to come by and share kicks with everyone here is a kick in itself. 1. Last weekend we took our guests to cute Suffolk villages like Lavenham. Great fun, especially as it was sunny for the first time in ages. We found an antiques store that sold lots of random old stuff, not just proper antiques, and had fun poking around the messy rooms. I bought a teacup, saucer and plate. 2. Then yesterday we went to the Cotswolds and looked around cute towns with names like Stow-on-the-Wold and Chipping Campden. The buildings were lovely but a highlight was definitely the many second hand bookstores – I returned home with a pile of inexpensive yet wonderful paperbacks. 3. I received an unexpected and thoughtful gift. 4. After having lost a few important pieces of paper, we girded our loins and waded into the plastic bags that consitute our filing cabinets. We didn’t find everuthing we were looking for but feel a lot more organised now! 6. I know it’s still ages till Spring, but the evenings are noticeably lighter now, the birds are singing more in the mornings (possibly happy there’s no snow and they can see food again) and tips of bulbs are popping up everywhere. 7. And even more cheery, today we went to Anglesey Abbey to see if any snowdrops had defied the cold and bloomed, and many had! Our guests were desperate to see some before heading home to Australia this week, so we felt very accomplished that we’d managed to find some. Love the title and story of Moon Theater. A boy feeding the night monsters is great and makes me wish I’d thought of it. Kicks? Well, desperate to raise money for the Austin art festival, I offered to make tiny art for folks at whatever price they named. And it worked! People played along & I’ve got most of the money I need. Big kick. Other kick was watching my son come out of school Friday afternoon with his nose in a book. He read while walking down the sidewalk and continued to read after he got in the car. And last kick–date night with husband. We get very few and we enjoyed Sherlock Holmes. I loved the bridge under construction. May your week be filled with many kicks! 3. This blog–Breakfast with Melissa Sweet was the best! Carol, glad you had a great birthday, and the new RIF office sounds so exciting. I’d be hankerin’ to get in there. BEST of luck to your father with his surgery, and travel safely. Tarie, nope, you’re not alone. Almost typed “Dessert” so many times. Sounds like you had a good week. And, yes, big congrats to Tanita! I almost singled her out, but as with my post on Monday, I was afraid to leave someone out if I started singling out anyone. So many folks who won that I consider friends. Very exciting. John, thanks for linking to the Harry Hamlin scene. I *almost* included a pic of him as Perseus in this post. I’ll have to show Piper that scene. It’s sufficiently creepy, so she may look away, but something tells me she’ll like it….Public Enemies is in our queueueueueue. But we gotta finish Deadwood first. Two eps only left. Sniff. …Thanks for the linkage. The movie-clips one, in particular, looks like it’ll be fun. Oh, and kick #2 is particularly cool. Emma, “raclette” is The New Thing I Learned From You This Week. Your kicks, as usual, are yummy, rich, multi-faceted, and happy. Heavens, Anglesey Abbey looks gorgeous. Marta, congrats on the fundraising and art! Also, when I see my oldest with her face in a book, it makes me happy, too. I want to see Sherlock Holmes but am certain it’ll have to wait for DVD. Hi, Catherine. Kick #4 isn’t safe for me to be reading now, when I need lunch. Perhaps I should take one of those nice, long walks instead. And THEN eat cupcakes. …I had to go look up Let the Great World Spin, and it looks mighty good. Well my kicks have been blown away by Little Willow and Jane. Can I just say WOW and congratulations to both?! 1. I have to say the Monday was the highlight of my week. Watching the live broadcast and actually knowing some of the winners was unbelievably fun. 2. Planning a Poetry Princess meet-up at ALA in June to celebrate with Tanita and Liz. 3. I invited Charles R. Smith, Jr (CSK illustrator award winner) and Carmen Bernier-Grand (Pura Belpré Author honors) to participate in poetry interviews for April BEFORE they won awards! Both said yes, BTW! That’s it for me. Have a great week all! Tricia, very excellent kicks, especially that you’ll get to see Tanita and Liz. And kick #3 is especially nice: The month of April at your blog is always rewarding. Thanks for the congrats, Jules! I’m mighty proud to be one of your Kicks today. Best wishes to all! I’m late. I’m late. Gone this weekend. But I am happy to see 5 of the Orbis books were CYBILS nominees and that The Secret Life of Walter Anderson was one of my faves. It just read aloud so beautifuly and what a great story. My kicks were spending time with one of the grandgirls, my critique group, and time with friends this weekend. Like Jules, your sisterly kick #7, and Jane, 40 pounds?!? ?, and Little Willow, SAG! !, and Tricia, D.C.!! My kicks are big and little. Ran a beautiful and easy half-marathon this morning and will sleep well tonight. And my new favorite tea — peppermint/licorice! Hi, Hester. Well-deserved honor for you and E.B.! Jone, thanks for stopping by, even if late. I always welcome late-comers. In fact, I’ve kinda stopped posting on Mondays so that late-comers will feel more of a welcome, if they want to kick on Mondays. Glad you had a good week. Liz, CONGRATS AGAIN! I just KNEW your beautiful book would be awarded in some way. And so glad you found a middle school you like for your daughter, but how can it be that she’s already going into middle school? Time really does fly. Yay, Little Willow, for being SAG eligible! I mean, you were always SAG eligible in our eyes, but I realize that we couldn’t issue you an official card. Jules: I love what your 5 year old said. Wait till she meets Percy Jackson and his cronies. I’ve allowed worries to overshadow my mood this week, and I really need to be thankful for blessings. I always tell myself that I will remember, and then I get wrapped up worries. I am on a happy high cause the Saints won and are headed to the Superbowl! Texts and calls from New Orleans, and I could hear how crazy the crowds were – so nice, the city really needed this. Congrats Jane on the 40 pounds! That’s awesome! Adrienne, the long walks and the homemade chocolates sound wonderful! JES/John – anytime you want tips for where to go in New Orleans, shoot me an email. Very happy to oblige when it comes to showing off my hometown. emmaco – your weekends in the countryside sound so amazing, and make me want to travel. Liz – an easy half-marathon? I am in awe. Way to go! I love that you all are tickled by same cop feeding the chickens. Funny, it never struck me as odd, but just a part of his wonderful unique personality. (He is my favorite person.) Very fun to see him through others eyes, so thanks to all of you for that. Made me grin a silly grin for him. So fun to come back and read all the kicks at the end of day! Have a great week! I love reading these, first thing Monday morning, when it’s still just-past-Sunday for all of you asleep. The ALA Youth Media Awards, a potential Princess Meet-up, Tricia’s April Poetry blogging (YAAAAY!) LW’s SAG-ability — and I’m so inspired by Jane Yolen. So much Awesome for which to be grateful. Happy week, y’all. Farida, I know all too well what it’s like to let worries get the best of us. In fact, when I start to get wrapped up in tiny worries (not that yours are that way, but mine usually are), I like to think about things like my kick #6 to remind myself how inconsequential my little worry is. Anyway, hope you have a better week. A worry-free one. RM, I really want to see Firefly, too. And, yes, doesn’t Emmaco’s kicks always make us want to travel? Thanks for the Wile explanation. That makes sense. Was there never an episode where he actually caught him? I guess that would be Looney-Tunes blasphemy or something, but maybe we can imagine it in our heads. Tanita, you had one pretty stellar week, huh? Congrats again on all the well-deserved honors and awards! Love your Kick #3! Leave it to a guy from Nashville to take care of things. Too funny!!! My super fantastic kick of last week was finding out that Grace Lin, one of my dearest friends, had won a Newbery Honor Award for her book WHERE THE MOUNTAIN MEETS THE MOON. I was also happy to see other kidlit bloggers like Tanita and Liz win major literary awards. Go, Grace! Also a well-deserved honor. What a great book.